Portable restroom operators living in areas prone to extreme weather aren’t the only ones who need to be prepared for Mother Nature. 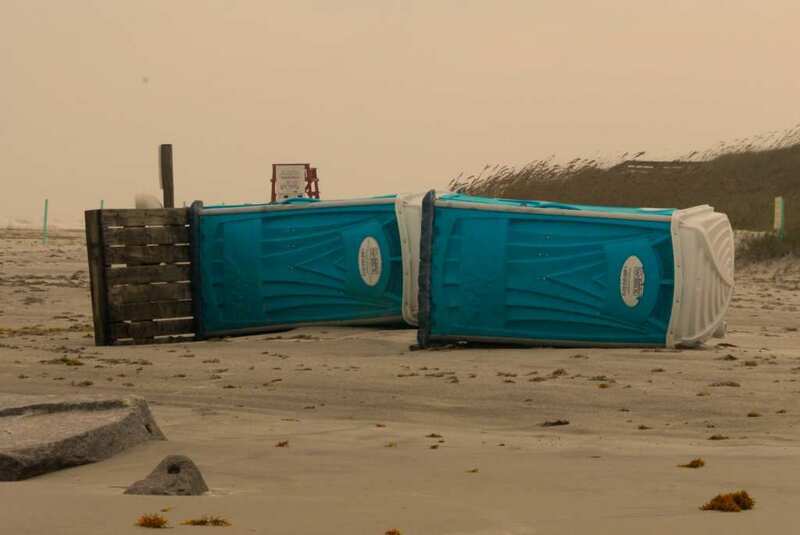 Natural disasters and unexpected weather events like wind gusts or floods can create costly disruptions for portable sanitation companies anywhere. Addressing these imminent disasters was a top priority at the 2017 Portable Sanitation Association International convention, where Ryan Anthony, training committee co-chair, presented an exercise on preparing portable sanitation businesses for weather events. “You want to do the best you can and have the best knowledge that you can,” Anthony says. Improperly addressing weather can affect the safety, aesthetics, and future business of a company, which can ultimately hurt profitability. Time and equipment are expensive. Whether you are dealing with hurricane winds, subzero temperatures, or floods, all can be devastating for a company and its bottom line. But many of the worst effects of these situations can be avoided if an operator is proactive. Companies in cold-weather areas may be better equipped when ice storms or snowstorms come about; they may already be seasoned to watching forecasts and preparing chemicals to keep their units from freezing. Others in warmer areas with occasional cold weather may not be so knowledgeable. Operators should educate themselves on the most common methods of preventing water tank freezing in units. These include using sodium- or methanol-based solutions, as well as using heaters, unit covers or skirts. In addition to keeping units viable in cold, Anthony stresses that operators should use care when moving or delivering units in icy conditions. Also to consider: Will service trucks be able to access the units? Will the units need to be secured to keep from slipping or toppling over? And don’t forget about the technicians who must service the units. They should be dressed appropriately and make sure vehicle gas tanks are full in case of emergency. Just as cold poses issues, so does heat. One of the biggest concerns about heat is odor, according to Anthony. Since heat accelerates decay of organic material, waste smells worse in warm weather. And decaying material can attract flies. When it’s hot, there are a number of things to pay attention to, including water tank levels, deodorizer choice, ventilation, service schedule, and employee safety. Anthony also says that certain precautions may need to be taken in especially windy conditions. High winds can be worrisome when transporting units. Operators should secure units with stake-downs or place them in a more secure location, away from gutters, ponds, and storm drains. Plans should also be in place for recovering units that may have been blown away. He says placement of units to keep them from getting blown over unexpectedly is one of the most forgotten concerns among PROs. In addition to sharing with staff, operators should also make customers aware of any considerations needed due to weather as they could amount to increased costs. For example, units may need to be serviced more frequently or moved. And those costs may need to be built into regular service rates. Living in North Carolina, Anthony recently experienced the wrath of Hurricane Florence. And he acknowledges the importance of the sanitation industry in the event of natural disasters. “As an industry, we’re very crucial for response to natural disasters — forest fires, hurricanes, etc. Sanitation is one of the top-three things needed,” he says. But operators can’t control many of the hazards that might affect business. So Anthony urges companies to take responsibility for what they can control and take the time to develop a risk-management or preparedness plan. Doing so can minimize business disruptions. Preparedness plans could include methods for responding to disasters, protecting business interests and contacting employees if traditional means of communication are out. “All of these situations have major impacts on how you do business.” However, with careful planning and consideration, operators can avoid disaster. In all, Anthony emphasizes optimizing and protecting equipment in hot and cold weather, securing and recovering equipment in windy conditions, preparing equipment for hazardous conditions, and providing service during or after a natural disaster. Ryan Anthony is co-chair of the Portable Sanitation Association International training committee and Satellite Industries manager for the Southeast region. To contact him, email ryana@satelliteindustries.com. Anthony’s original presentation, “Portable Sanitation and Weather/Hazards,” will soon be offered online as part of a series of 1 1/2-hour long courses developed by the PSAI. For more information, visit www.psai.org/about-our-courses.